The Firecat, who dwells upon the threshold between the worlds, has been persuaded to give us the benefit of her encyclopaedic knowledge of all things connected with the stars — movie stars, that is! Little is known of the origins of the Firecat, which are shrouded in the mists of time. However, it is believed that the Firecat (owning a gaze blank and pitiless as the sun) was first seen skulking on a mountainside in a tropical island paradise, was captured and brought kicking and scratching to civilisation as we know it. Let it then suffice that without the spitting, scratching and spluttering of this lovable, yet sometimes menacing creature, little or no material would ever slouch towards this website to be born. This image of the Firecat comes from Artist for Hire. Mick Jagger — Firecat's Star of the Week! The Firecat, one of our earliest (and most secretive) partners at Astrology on the Web, has been persuaded to write a new column for us every week, featuring Movie Stars by the Stars! 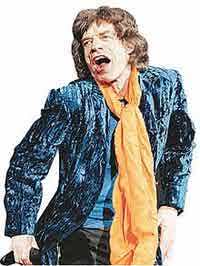 The Firecat picks a Star whose Sign is the current Zodiac Sign — and this week she has chosen Rolling Stones idol, Mick Jagger. Mick Jagger was born in Dartford, County Kent, England on 26th July, 1943, at 2.30 AM BDST (for a more detailed bio, click here). He has acted in at least eleven films the most famous of which are "Ned Kelly" (1970) and "Bent" (1997). As well as achieving fame as an actor, he is best known for his singing, but he also a prolific producer and documentary film maker. He attended the London School of Economics for a time, but thankfully it wasn't his true calling and Destiny had other plans for him. 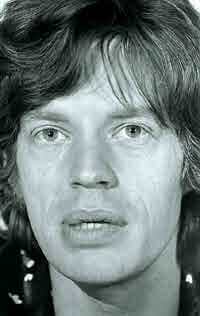 Mick is a typical Leo – very creative particularly where performance is concerned, with talent to burn. He has incredible energy, especially when you consider he's in his sixties. Mick Jagger and guitarist Keith Richards have known each other since childhood and out of their mutual love for the blues, "The Rolling Stones" were born. He was recently knighted (2002) after being overlooked for many years and has had a very colourful life. He has two ex-wives - Bianca Jagger and the supermodel Jerry Hall and seven children with four different women. A busy boy indeed! A quick look at Mick's chart shows us that not only does he have his Sun (inner character) conjunct fortunate Jupiter/Pluto in a dazzling Leo stellium, but this fiery life-force is in dynamic square aspect to his Moon (emotional personality; the public) in musical Taurus. He has witty, communicative Gemini rising, so he is a sensual, charismatic performer, with loads of musical and writing talent. His Saturn rising in Gemini strengthens his intellect and because it is in exact sextile to his natal Part of Fortune, gives him the ability to stick at his chosen profession over the long haul and to achieve much in later years. Can we expect more excitement from this fantastic entertainer, even though he has already reached what many may see as the pinnacle of success? Will his weakness for women yet be his downfall? His progressed Sun entered Libra (relationships; harmony) just over a year ago, as his progressed Ascendant entered Leo. Now progressed Moon been in Leo for a year or so and has presented him with a major new direction in life, due to the conjunction in turn with natal Sun, Jupiter, Pluto and Mercury. His Moon will conjoin natal Dragon's Head (North Lunar Node) in November 2004, showing that his personal transformation is not yet over, but that he will experience a powerful and fortunate dose of energy towards his chosen life path. An entirely new set of experiences is emerging as the influence of the fixed, fire sign Leo shows he will have his heart awakened, and his feelings will turn from personal attachment into a broader-based form of feeling and emotion. Sir Mick is a perennial Peter Pan and it seems this Rolling Stone will never gather any moss.